Regenerating Day Cream Complexion leaves the skin feeling noticeably smooth while refreshing any skin tone with light-reflecting, subtly bronzing mineral pigments. It can balance out the look of slight pigmentations and reduce the appearance of lines and wrinkles for a radiant, flawless appearance. The composition featuring revitalising plant extracts of red clover, bryophyllum and field horsetail helps support the skin’s moisture-activating ability, while avocado and olive plant oils protect the skin, nourish it and support its own powers of self-renewal. Regenerating Day Cream Complexion absorbs easily, awakening every skin tone with a tender kiss. The cream is also an ideal base for make-up. Apply to the face each morning after cleansing, toning and revitalising. We recommend that you use non-oily night time skin care after cleansing and toning with Dr. Hauschka Regenerating Serum. Dr. Hauschka ampoule treatments can be used over a 28-day period as stimuli. When your skin needs extra care in winter, apply a daytime skin care product prior to Regenerating Cream Complexion. 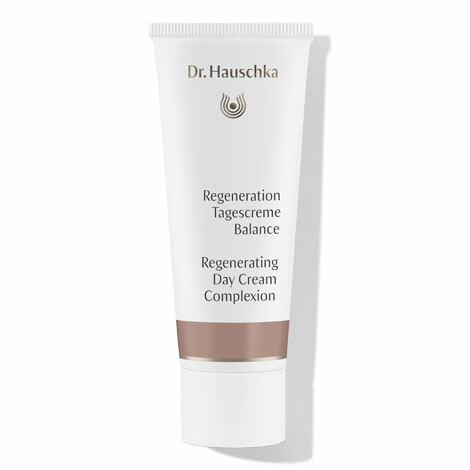 Regenerating Day Cream Complexion is part of the comprehensive Regenerating Skin Care line, which we have developed to offer intensive skin care to demanding and mature skin. Get to know the Regenerating Skin Care products with the Effective & Essential Set.